Sigma has been giving Canon and Nikon a run for their money in their recent introductions. Their 18-35mm f/1.8, 135mm f/1.8 and the 120-300mm f/2.8 lenses are well regarded, received great reviews and priced very competitively. Now word is Sigma is ready to challenge Canon again in a very popular focal length. They are working to introduce a 24-70mm f/2 lens for full frame sensors. 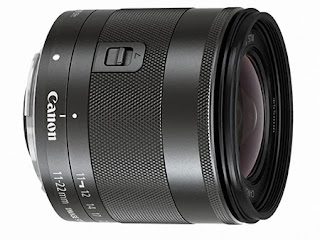 Personally, I find the Canon EF 24-70mm f/2.8L II lens overpriced ($2,299) in light of the incremental improvement over the Series I lens. 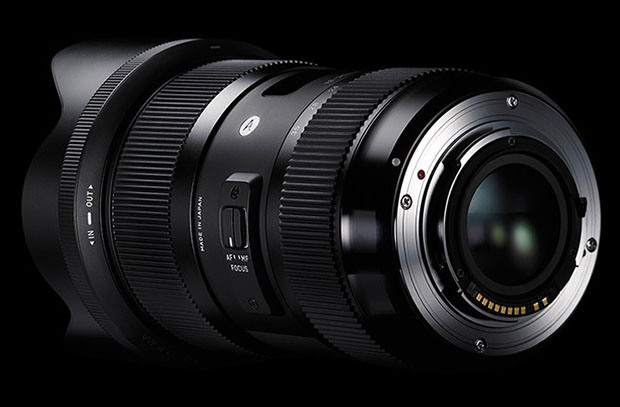 Sigma's introductory time frame for their 24-70mm lens will be mid 2014. Watch for the price of the competing Canon lens to drop as 2014 approaches. 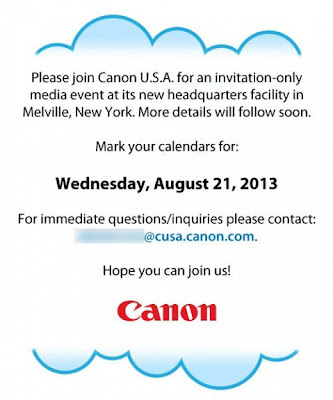 Canon USA has scheduled a media event in its new headquarters in New York on August 21, 2013. Is this just a big celebration of their new HQ or will Canon make use of the attention an introduce some new products? I was hoping maybe Canon will take this opportunity and announce some new products or product development in progress. Apparently, only new Powershot cameras will be involved and a big splash on how to take advantage of the recently introduced Project 1709, a photo management software from Canon, perhaps Cloud-based. There is still time for Canon to add something more interesting to the venue so please check back for the latest information and development. 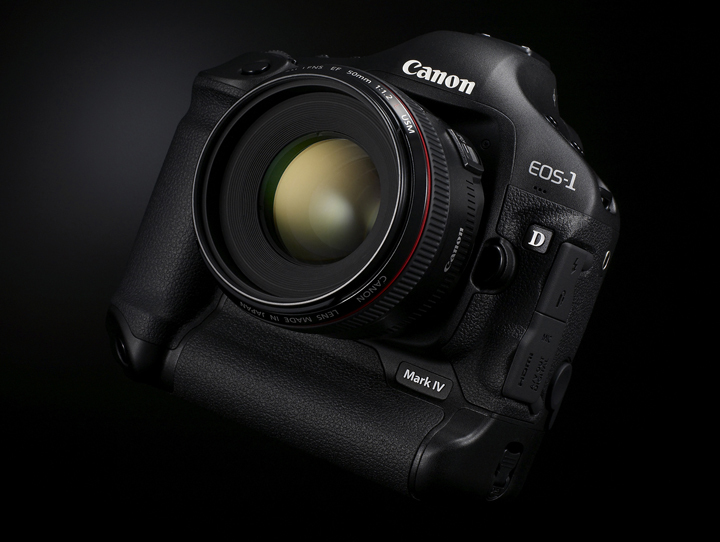 Canon has issued new Firmware updates for their older EOS-1D bodies. There is nothing critical to fix and no new added functions, plus the fixes are relatively minor. I may not even bother unless I can find the time. The following fixes have been incorporated in the new firmwares. Resolves the following phenomenon: when the camera is not attached to a lens, power consumption may be higher than usual, causing premature battery drain. Resolves a phenomenon in which “Err 02” may be displayed when the shutter is released without a lens attached. Canon USA has scheduled a media event in its new headquarters in New York. Is this just a big celebration of their new HQ or will Canon make use of the attention an introduce some new products? My guess is, most probably. The EOS-M camera line is waiting for an upgrade but since this line is not selling well outside Asia, Canon may not want to use this event to highlight their less than stellar camera line. The long awaited, megapixel EOS-1 camera is a remote possibility but most likely it will be announced later this year, with a delivery date in 2014. The Canon EOS-70D has been announced but will not be shipping until late September, although Canon is looking to speed up their delivery schedule. This leaves the Canon EOS-7D Mk II camera. Canon may not want to 'upstage' the EOS-70D before it has a chance to reach the camera stores, but a teaser announcement of the 7D replacement cannot be ruled out. Personally, I am very eager to get my hands on the Mk II version of the EOS-7D. It should be another winner, just like the current model. Read the latest post on this topic. Digital Life Innovator, a website in Japan, posted a new set of sample photos taken with the recently introduced Canon EOS 70D camera and the EF 60mm f/2.8 Macro plus the EF 18-135mm f/3.5-5.6 IS STM lens. Image quality is very good, even when ISO 3200 was used. Another website in Korea, DicaHub, reposted the series of photos showing the entire ISO range (100-12800), with additional crops taken from each test picture. You can read the article in Korean here. The tests show the EOS-70D can be quite an impressive camera with the new Dual Pixel CMOS AF technology. I will put the camera through a photo shoot out in the field once delivery starts in late September. Read the camera announcement here and an explanation on the Dual Pixel CMOS AF Techbnology. You can pre-order the EOS-70D camera from many retailers for $1,199 in the U.S. The Canon EOS-70D camera was announced on July 1, 2013 and has already generated tremendous excitement with its ground breaking Dual Pixel CMOS AF technology. You can read the official announcement and read a detailed explanation on the Dual Pixel technology. The camera is available for pre-order and you can download the Owner's Manual here. Canon engineers have delivered a technological breakthrough with the new Dual Pixel CMOS AF system in the EOS 70D camera. This new AF system provides excellent AF performance in two situations that, up to now, have been problematic for SLR shooters — taking still images while using Live View and while recording video. In the .PDF document on this page (scroll below for link to .PDF file), engineers from Canon Inc. in Japan, who were directly involved in the creation of this new AF system, provide insight into the Dual Pixel CMOS AF concept and the challenges they faced in developing it. It’s a look inside the engineering department of a major camera maker, which is rarely seen from the outside. Click here to read the article in its entirety on Canon's website. The EOS-70D is schedule to ship in late September. You can pre-order the camera by clicking on my earlier post. You can ask Digital Photo Professional to open specific file types – such as JPEGs, RAW files and TIFFs – after EOS Utility has imported them. The most current Digital Photo Professional software is version 3.13.0, but it’s well worth keeping DPP up to date. The latest version supports new Canon lenses and recognises RAW format files from the more recent Canon EOS DSLR cameras. If you’ve got an older version of DPP already installed on your computer it’s free to update it. Indeed, if you’ve lost your software disk, you can download and install DPP for free. To download an update for DPP (or install it from scratch) just click here for the Canon Europe Download Center, then enter your country, product type and camera model details and select the ‘Software (drivers and applications)’ option. The menu will offer a variety of downloads such as ImageBrowser EX, EOS Utility and EOS Digital Solution Disk Software, so scroll down and click on the appropriate link to download DPP for Mac or Windows. While you’re there, you can also download a copy of the EOS Utility software. You will also find a copy of DPP’s manual, which will help you to further maxmise all of the functionalities of the software. Click here to read the article in its entirety on Canon Professional Network website. Some are claiming they have 'confirmation' there is a Canon 'camera' out there with a 75+ MP sensor floating around. Like I said in my last post, there is no doubt Canon is experimenting on sensors beyond the 50+ MP range. They have technologies on their shelves that will make your head spin. In fact, experimental sensors may even range up to 100+ MP but to have an EOS-1 type camera with a 75+ MP sensor in some photographers' hands, out in the wild, lacks credibility in my book. Of course, there is no way to prove a negative since if this camera does exist in some photographers' bag, they must have been required to sign an air-tight, Non Disclosure Agreement with Canon. It is rather fruitless to claim the existence of some camera that may never see the light of day. Fact of the matter is, Canon is too conservative a company to put a super megapixel sensor on the next EOS-1 body. They will most likely follow their tried-and-true formula and introduce a 40+ MP sensor on their next megapixel camera some time later this year, with delivery expected early next year. 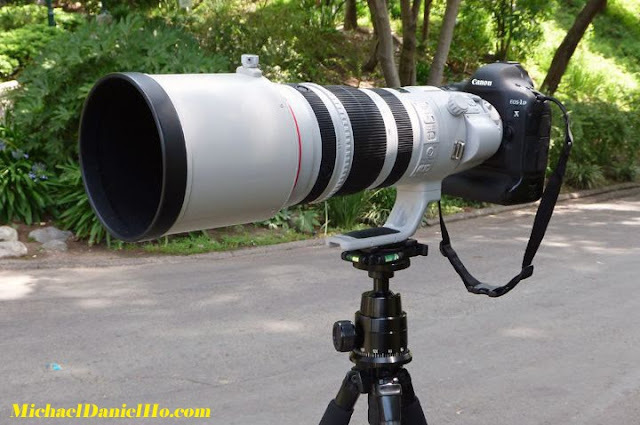 Canon started the development of the EF 200-400mm f/4L IS 1.4x lens over two years ago. When the official announcement came on May 14, 2013, I immediately put my order in even though the weight and price are higher than I have expected. The lens arrived in June and this hands-on review will not have charts, graphs and technical details. You can read that in Canon's announcement above. It assumes the reader already has a familiarity with Canon cameras and super telephoto lenses. All opinions and observations are my own and from the standpoint of a wildlife photographer out in the field. I am a wildlife photographer and have been using Canon equipment for almost twenty five years. My subjects range from tiny Hummingbirds to Blue Whales, the largest animal on Planet Earth, ever. Over the decades, I have used and owned many L series prime, zoom and Super telephoto lenses. When the Series II versions of the Super Telephoto lenses came out in 2011, I refrained from upgrading until I have a chance to use the EF 200-400mm lens. Generally I am not overly excited by any new piece of Canon equipment, the EOS-1D X camera (read my review) was the last exception but this new lens carries all the promise of a zoom lens with a built-in extender, all packed into a Super Telephoto lens barrel. The debate between prime and zoom lens is over for me long time ago. The image quality of the current generation 'L' zoom lens are comparable to their prime cousins. I cannot emphasis the flexibility of having a top quality super telephoto zoom lens. For years, I have suffered through missed opportunity when using prime super telephoto lens on wildlife. Once the animal comes too close, there is a mad scramble to back up or try and grab another camera with a shorter focal length. Invariably, I would end up missing crucial shots. The most annoying thing about Canon's Super Telephoto lenses is their factory lens cap and the EF 200-400mm is no exception. I immediately substituted it with the Don Zack lens cap. The DZ caps are on all my Super Telephoto lenses. My first impression of the EF 200-400mm is a rock solid, semi-large and heavy (7.98 pounds) but manageable lens. It measures 5 inch in diameter and 14.4 inch in length without the lens hood. The lens hood is interchangeable with the EF 400mm f/4 DO IS lens. Most of the controls are located at the rear of the lens - extender control lever, IS modes, focus modes, focus limiter and focus preset control. The lens takes 52mm drop-in filters, which are inserted in the rear of the lens via the included drop-in filter holder. Rubberized zoom and focus rings are on the lens barrel, the textured playback ring, and the front-most grip ring that incorporates four AF Stop Buttons. I have examined in detail the area where the extender control lever is located because this is a place where dirt may accumulate and moisture can seep into the lens out in the field. However, I am comfortable the lever will stand up to field use provided regular cleaning is maintained. The front and rear lenses elements are fluorine-coated to repel water, dust and dirt. When used with the Canon EOS-1D X and Mk IV cameras, the package is weather-sealed and make cleaning easier on photo shoots. The built-in 1.4x extender (see bulge in photo below) is specifically designed for the lens and there are three IS modes, like all the other Series II Super Telephoto lenses. Mode 1 is for stationary subjects. Mode 2 is for panning subjects, like bird in flight. Mode 3 is only available on Series II super telephoto lenses. In Mode 3, IS sound can be detected when the shutter release is half-pressed, but the image is not stabilized until the precise moment when the shot is taken. When I use a Canon IS equipped lens, I always leave the IS on and set to Mode 1. To be honest, most of the time, I find there is a difference without a distinction between Mode 1, 2 and 3. After handholding and panning for so many fast moving wildlife shots over the years, I have developed a rather good technique for myself already. Up to now, no Canon Super Telephoto lens comes in a zoom. Adding a built-in 1.4x extender and a fixed f/4 aperture over the entire zoom range is a game changer for me. By the way, the minimum focusing distance over the entire zoom range is only 6.6 feet. This means I can get closeup to the wildlife action. 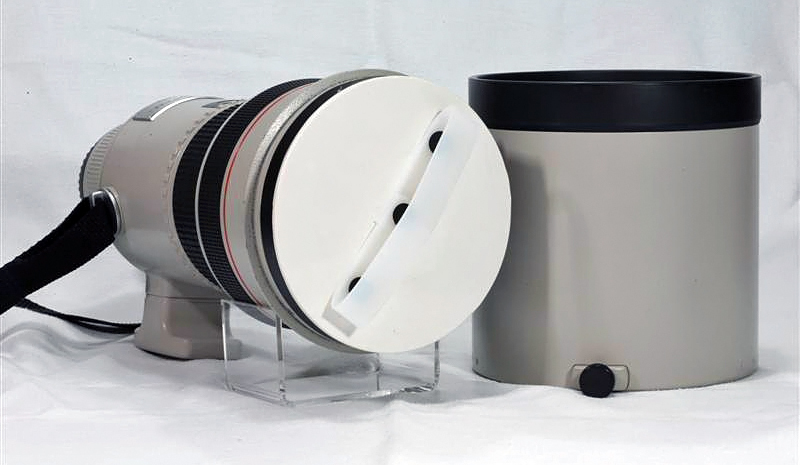 Although this lens is revolutionary for a 'L' design, Canon actually experimented with the Canon FDN 1200mm f/5.6 lens with a built-in 1.4x extender back in 1984 during the Olympic Games in Los Angeles. To say the EF 200-400mm lens' zoom range is flexible is an understatement. In addition to the built-in 1.4x extender, the lens also accepts the EF 1.4x and 2.0x III extenders. This means the lens can have a possible zoom range of 200mm to 1,792mm, when used with a combination of full frame, APS-H and APS-C cameras. EOS-5D Mk III and the EOS-1 bodies will allow AF down to f/8. Auto-focusing with apertures smaller than f/8 is not possible but this lens is well designed for that with FTM (full time manual) focusing built-in. I am not a big fan of the 2.0x extender but the 1.4x is another matter. With the EOS-1D X or Mk IV cameras plus the EF 1.4x extender mounted on the EF 200-400mm f/4L IS, my focal length starts out at 280mm and ends at a little over 1,000mm. This immense focal length range encourages creativity and open up endless possibilities for my long lens photography. When the EF 1.4x extender is attached and the EF 200-400mm internal extender set to 1x, any AF points can be selected with the joystick. When the internal extender is set to 1.4x, only the center AF point works. When the EF 2.0x extender is attached and the internal extender is set to 1x, AF slows down and only the center AF point works. If the internal extender is set to 1.4x, manual focusing will be required. This works well for me since I like to add the 1.4x extender sometimes and work mostly with the center AF point anyway. AF is lighting fast, even with the addition of an external 1.4x extender. It took me a little while to get used to the fact I can actually zoom in and out with this Super Telephoto lens and finding the extender lever by touch without having to take my eye off the viewfinder. After that, it was rather instinctual in changing the zoom range, landscape to portrait mode, AF points, ISO setting and exposure control, all in quick succession, without ever taking my eye off the subject. I snapped a few bird photos and am quite pleased with the initial results. 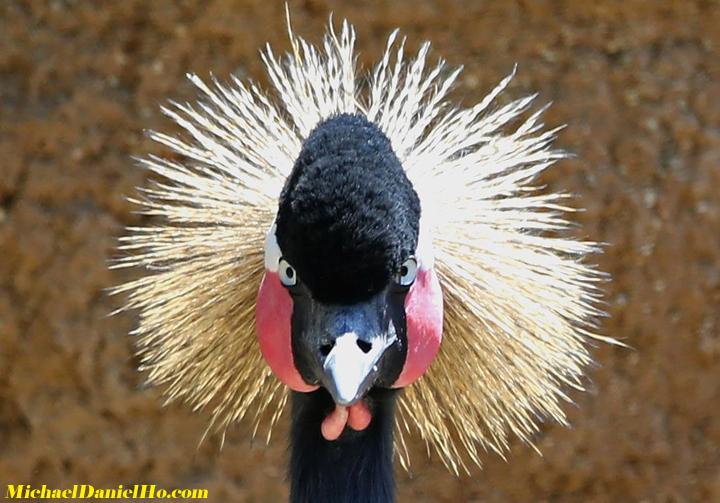 Look at the image quality of the 100% crop Chimpanzee and Victoria Crowned Crane photos. They were taken from about 100 and 40 feet away, handheld. The built-in extender was switched off with the Chimp photo but switched on with the Crane shot. The IQ of the Bird-in-flight shots are equally impressive. All photos taken with the EOS-1D X at 400mm f/4, IS Mode 1, AI Servo. Hand-holding my camera and traveling light on photo shoots are my preference. Despite the weight of this lens and the EOS-1 camera (about 11 pounds), I am able to hand-hold (with proper technique) the combo for a short while even though I am of average height and build. When I do use support, my pick is the SLIK PRO 634 CF carbon fiber tripod and the SLIK SBH 550 ball head. SLIK equipment is the best value in my opinion and highly underrated. The combination weighs 3.3 pounds and can support the EF 200-400mm f/4L lens plus the EOS-1 camera with ease. Visit my equipment bag on my website to see all the gear I use on photo shoots. 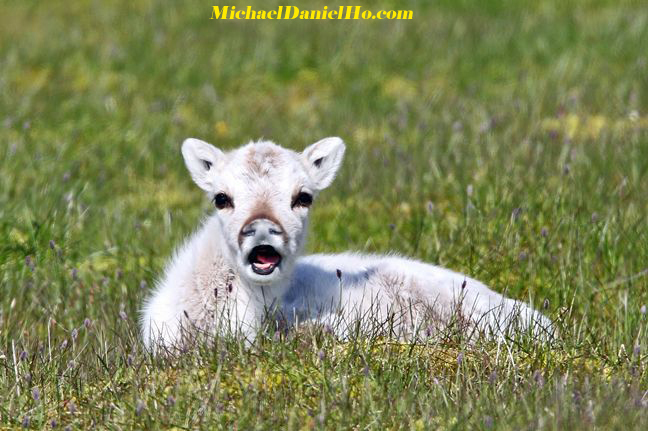 My next few wildlife photo shoots start in early August and last through Autumn. 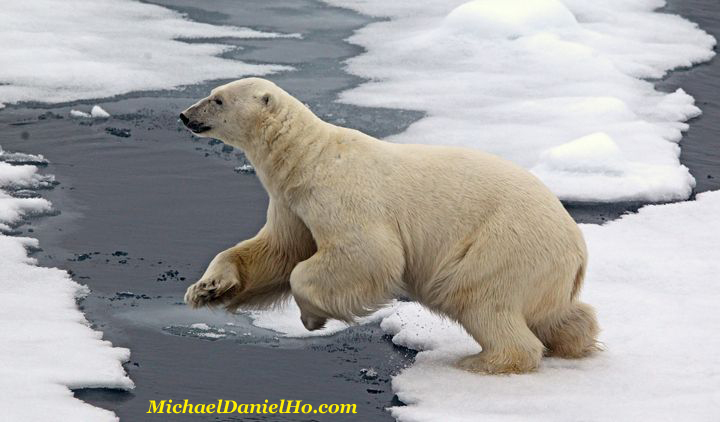 Just came back from Svalbard in the high Arctic to photograph Polar Bears and other wildlife. The EF 200-400mm lens is rather cumbersome in a bouncing zodiac but on a stable platform, it works flawlessly. Will be taking it to Alaska, Africa and the Canadian tundra in the next few months. You can follow me on Facebook, Flickr, Twitter and this Blog to keep up with my travels. Keep checking back for additional photos and addendum to my hands-on review of the EF 200-400mm f/4L IS USM Extender 1.4x lens as I return from additional photo shoots. The Canon EOS-70D camera is available for pre-order now at the Canon Store or your favorite camera retailers for $1,199. Estimated shipping date is late September, 2013. You can read the preview of the camera here. TOKYO, July 24 - Canon Inc. cut its profit forecast for the year to December and trimmed its sales targets for both high-end and compact digital cameras as a slowdown in China and other emerging economies caught the company off-guard. Canon, the world's largest maker of digital cameras, kicked off the quarterly earnings reporting season for Japan's big-name tech manufacturers by cutting its operating profit forecast to 380 billion yen ($3.81 billion), down 16 percent from guidance issued just three months ago. Canon and other Japanese camera makers have already been hit by a slump in sales of compact digital cameras as consumers increasingly use smartphones to snap photos and this has weighed on Canon's earnings and share price. "We had expected that compact cameras would be bad, but it looks like the interchangeable-lens cameras they'd been pinning their hopes on also don't seem to be selling like they'd expected in China and other emerging economies," said Mitsushige Akino, chief fund manager at Ichiyoshi Investment Management in Tokyo. Cameras now account for more than 60 percent of its overall operating profit and it had counted on its strength in high-end interchangeable-lens cameras to offset evaporating demand for compact cameras. On Wednesday Canon cut its target for interchangeable-lens camera sales to 9 million from 9.2 million, while compact cameras were cut to 14 million from 14.5 million. The previous projections were given at its last earnings report in April. "Chinese consumers tend to be very fond of cameras, especially high-end ones such as SLRs, but an economic slowdown has hit just as sales were recovering from last year," Tanaka said, referring to a sharp fall in China sales in late 2012 as consumers shunned Japanese products due to a territorial dispute. Competition for compact cameras from smartphones is also likely to heat up with both Samsung Electronics Co Ltd and Nokia Oyj introducing phones placing high-quality cameras at the heart of their designs. High end DSLR camera manufacturers like Canon and Nikon have many products on their shelves waiting to be released but if they hold back and wait for the consumer market to rebound before introducing new models, they run the risk of boring photographers with old, uninspiring merchandise. My advice to them is to start replacing their higher end DSLR models and lenses on a 3-4 and 7-10 year cycle respectively. The medium to lower end products are mostly taken care of with slick marketing, endorsement campaigns and more frequent introductions. 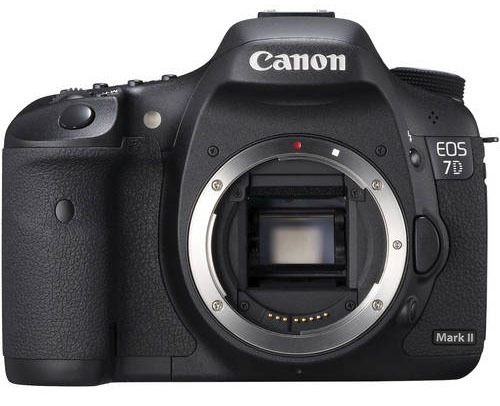 On that score, Canon needs to announce the EOS-7D Mk II and a megapixel replacement to the EOS-1Ds Mk III cameras before the end of the year. The first camera is almost 4 years old and the second one is no longer in production. Consumers are eagerly awaiting new technologies recently introduced to be incorporated into these two camera bodies. Dual Pixel CMOS AF is a groundbreaking technology from Canon that unlocks the potential of Live View, changing forever the way users will capture video and still images with a DSLR camera. Dual Pixel CMOS AF powers incredibly smooth and consistent autofocus – like that of a camcorder – so focus transitions are natural and subjects remain locked in even as they move. It also enables phenomenally accurate and faster-than-ever autofocus through an LCD monitor, allowing the user to realize the unique compositional freedom of angle that Live View is capable of providing. And the compatibility of Dual Pixel CMOS AF with 103 Canon EF lenses empowers the user with exceptional optical tools for nearly limitless creative options. All these remarkable advances are possible thanks to an innovative technological design. For the first time in an EOS camera, the individual pixels on the CMOS sensor are capable of both capturing light and performing phase-difference detection autofocus. This revolutionary leap in Live View autofocus performance cements Live View shooting as an outstanding complement to traditional viewfinder shooting, unleashing wonderful new possibilities for dynamic, creative, high quality video and still capture in more situations than ever before. You can read the Canon announcement of the new camera here. The Canon EF 1200mm f/5.6L USM lens is truly a Super Lens and a legend in its own right. This super rare, full autofocus lens in no longer in production. The predecessor to the Canon EF 1200mm lens was the Canon FD 1200mm f/5.6 L manual focus lens. The lens made its first debut during the 1984 Olympic Games in Los Angeles, California. 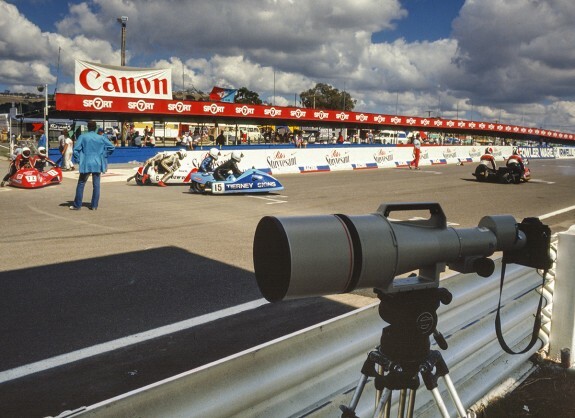 Chuck Westfall of Canon USA was there and recalls that "5 copies of the original FD 1200mm f/5.6 L lens were brought to L.A. and used for newspaper, magazine and wire service coverage of the Olympic Games." Chuck Westfall further remembered that "All of the FD mount EF 1200mm f/5.6L lenses were eventually shipped back to Japan, and at some point in the late 1980s, they were converted to EF mount," resulting in forerunner of the current model - the Canon EF 1200mm f/5.6L USM lens. The new EF 1200mm was officially announced by Canon Inc. in July of 1993 with an annual production volume of around two lenses per run. The EF 1200mm was available by special order, almost entirely hand-made, with lead times running around 18 months. There are no reliable data to indicate how many copies were made. 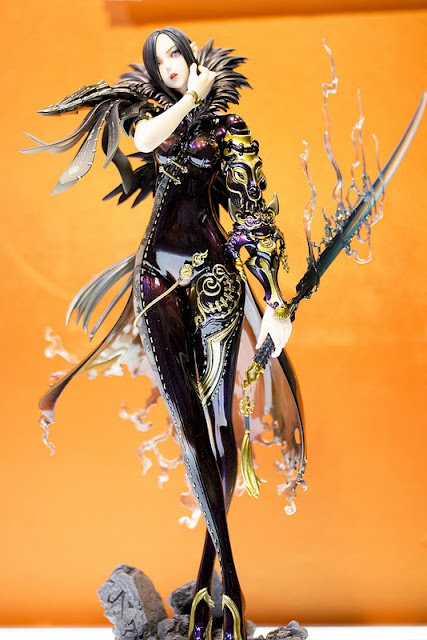 The estimate runs from anywhere between two dozen to less than one hundred lenses and Canon Inc. is not releasing any figures. The EF 1200mm is compatible with EF extenders and adding the 1.4X and 2.0X extenders will yield 1680mm (f/8) and 2400mm (f/11) focal lengths. The original price of the lens was almost 10 million yen, about $90,000 depending on the exchange rate at the time. Now that the lens in no longer being manufactured, the asking price has gone to well over $100,000, (if you can find one) or about the price of a small house in America. Canon Professional Services owns two of these Super Lens. Sports and wildlife magazines, news and government agencies, photographic collectors are some of the likely owners of this lens. Realistically, most people cannot or will not want to own this lens. For starters, it weighs over 36 pounds and requires two people to set up the lens before it can be used. The current EF 800mm f/5.6L IS USM lens lists for $13,999 and weighs less than 10 pounds. For more information on the EF 1200mm f/5.6L USM lens, visit the Canon USA website. The Japanese Photography Blog, Egami has discovered a Canon patent for the EF 50mm f/1.8 IS lens. You can read the original article on their website. The current EF 50mm f/1.4 lens is an excellent product but is in need of an upgrade. It is possible Canon has decided to add IS to its replacement although it is by no means certain. Canon Non Bayer Multilevel 75+ MP Sensor? The rumored Canon 75+ MP sensor being tested is apparently a Non Bayer Multilevel Sensor. This technology was patented earlier this year. It is nothing unusual and Canon experiments with new technology all the time but the chances of most new patents turning into marketable products are low. I am very skeptical Canon has a prototype camera out in the field with this rumored sensor and still expect them to introduce a megapixel EOS-1 camera some time next year in the neighborhood of around 40+ MP sensor. There is a chance Canon may introduce the megapixel camera later this year but delivery will most likely be in early 2014. I am back home in California after a wildlife trip circumnavigating the Svalbard archipelago in an expedition ship and spending some time in Norway after the photo shoot. The high Arctic is a fascinating place and it can bring out the best and worst in photographers and equipment alike. The archipelago is mostly ice free in the south and one has to go way north, above 80 degrees to even find sea ice. This proved a challenge to finding Polar Bears and seals. The permanent ice sheets are still there but fast ice is tough to locate. Even though this is the high Summer in the high Arctic, the weather can range from severe cold, well below freezing temperatures with light snow and 40+ knots winds to sunshine, T-shirt weather and BBQ on the deck of the ship. The latter suited this Californian just fine. I have been to all the Scandinavian countries and find the people friendly and enjoyable. Sadly, some in Norway find no incongruity in going on a whale watching trip and then eating a whale fillet burger after the outing. Thankfully, Polar Bears are now protected in Svalbard now but in the past, they were wantonly slaughtered for their hide and even for fun. Sadly, Polar bears are still hunted for 'sports and trophy' in Canada and other places. You can see more Polar bears photos from my past trips here. The Canon equipment I brought with me, EOS-1D X, EOS-1D Mk IV, EF 400mm DO, EF 200-400mm f/4L IS and EF 100-400mm f/4.5-5.6L IS, all worked fine under severe field conditions except one of the legs on my light weight Slik carbon fiber tripod broke under very cold temperatures. It was mostly my own fault for loading the tripod with much heavier weight than recommended. Now comes the time that I am not looking forward to after every photo shoot. Trying to get back to the daily routine and going through the photos. 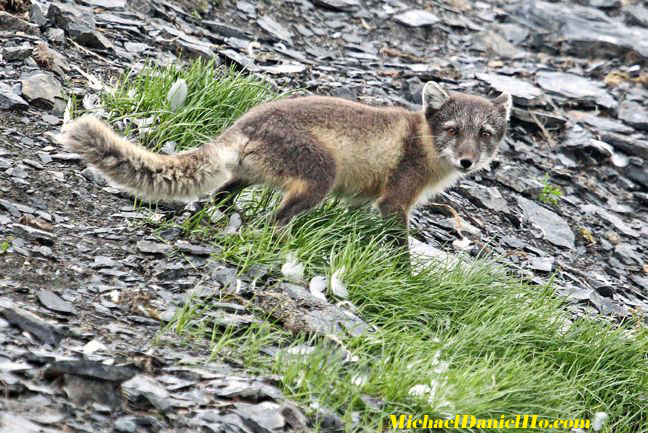 Unfortunately, I do not have a lot of time since I am scheduled to go on another wildlife photo shoot in early August to Alaska. For more posts on photographing other wildlife, you will find Hummingbirds, African elephants, Polar bears, Bengal tigers, Killer whales and Blue whales adventures here. 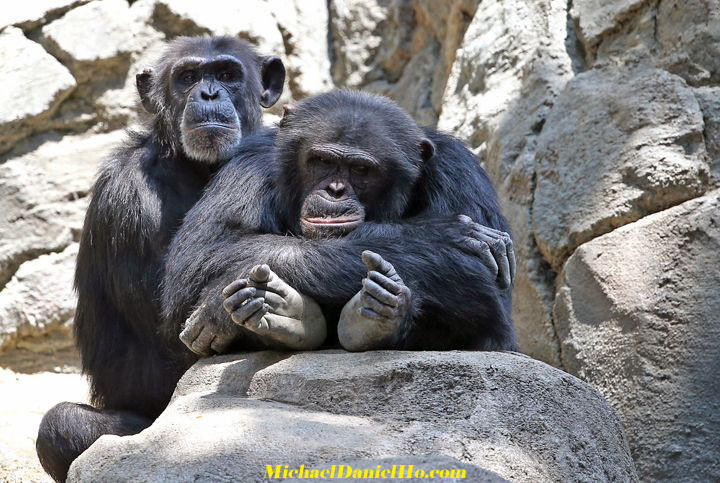 I have been a wildlife photographer for 25 years using Canon gear. You can read my FAQs on equipment and see more of my work on MichaelDanielHo.com. You can also follow my travels on my Blog, Twitter and Facebook. How to get the most out of the Magic Lantern hack of the Canon EOS-5D Mk III camera's software. There is a rumor floating around that Canon is testing an EOS-1 body with a 75+ MP sensor. We already know Canon has different megapixel prototype cameras out in the field with about 40 - 50 MP sensors. I find this story with little credibility and expect Canon to introduce their EOS-1Ds Mk III replacement some time next year with a megapixel camera of around 40+ MP sensor. This is not to say Canon does not engage in research on sensors greater than 50+ MP but to have a 75+ MP prototype camera in some photographers' hands is extremely unlikely. There is a chance Canon may introduce the megapixel camera later this year but delivery will most likely be in early 2014. 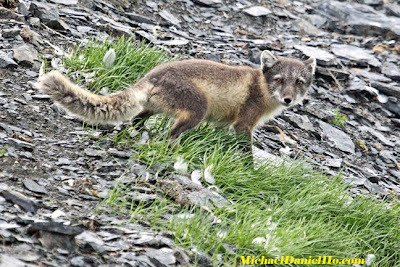 I just got back from a Wildlife Photography shoot in the Arctic circle. It will take me a few days to get back to my regular routine and post some photos and catch up on some photography news. You can read my earlier synopsis of the trip here. The above video from Magic Lantern using the Canon EOS-5D Mk III camera illustrates the difference between normal RAW and Dual ISO RAW. Take a look at the shadow noise reduction in the Dual ISO RAW example, it is very impressive. The video was produced under adverse condition so much better results can be expected when used under normal conditions. I am back in Norway after circumnavigating the Svalbard archipelago on a small expedition ship. The archipelago's size is hard to estimate accurately because it has not been completely surveyed and explored due to its remoteness and often inaccessible condition caused by sea ice but the closest estimate is about 23,000+ square miles. The largest island on Svalbard is Spitsbergen and the year round population is about 2,000+ people residing mostly in its 'capital', Longyearbyen. During our entire voyage, I have not seen more than two other ships. This is the Land Of The Midnight Sun with 24 hours daylight. The weather can be very cold, even in summer because this is the high Arctic. It can range from a cold, windy day with some sun to foggy and severely cold temperatures, replete with light snow the next. Winds can reach 40+ knots and all landings are done by zodiacs. As my readers know, the only reason I am here is for the wildlife and on that score, the sightings and encounters are good but not spectacular. This is the vicissitudes a wildlife photographer must be prepared to accept. There is never a guarantee of complete success because the wildlife may be too far or they are not active enough to produce good photographic opportunities but I managed to get some decent photos of Arctic fauna and landscapes. I came cross a few Humpback and Fin whales. The most common fauna up here are pelagic birds. There are a variety of different species of sea gulls and I am happy to report my photos include Ivory Gull, Common Eider, Thick-billed Murre, etc. in flight. Saw a small group of white-beaked dolphins but cetaceans sightings are not as numerous as locations in lower latitudes. Polar Bear encounters are mostly from a distance but one bear came very close to the ship. Finding bears are quite a challenge despite the fact there is a population of about 3,000 animals in Svalbard. 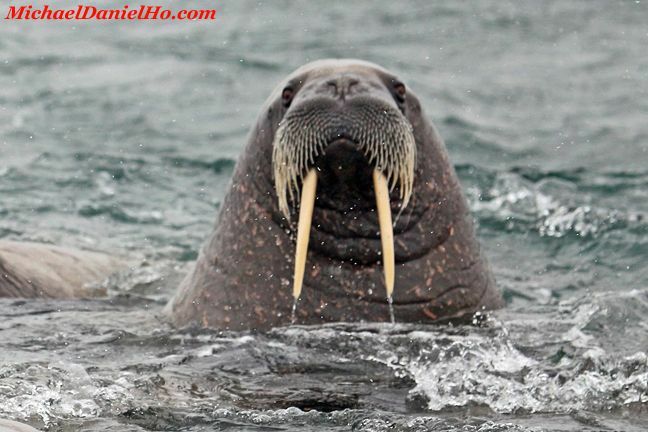 My Walrus and Reindeer encounters are a bit more promising and I photographed the former on land and in the water. As you can imagine, I have little time or equipment to go through the photos I have taken but managed to extract a few preliminary images for illustration. 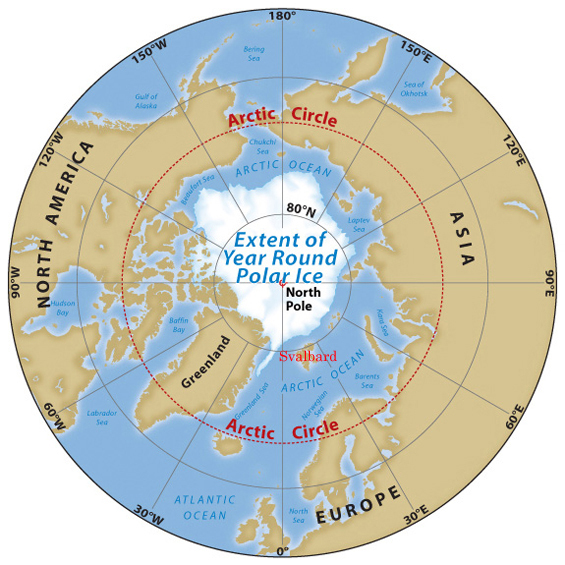 Not surprisingly, the polar region is warming and the sea ice have all melted in the southern part of the archipelago and fast ice can only be found on the northern end of the islands. This is where Polar bears are most likely to be found but it was difficult to locate them. Just as in remote parts of Alaska, high powered rifles are part of the equipment in addition to high powered lenses because an unplanned bear encounter can prove to be disastrous. Overall, I am quite pleased with the trip and will do a little travel photography in Norway before returning to California. Be sure to follow me on Facebook, Twitter and my Blog because I will be posting my latest photos as soon as I get back home. The programming team at Magic Lantern team has done it again. They have given the Canon EOS 5D Mark III and Canon EOS 7D approximately 3 additional stops of dynamic range using a new way of taking a photo by using ISO 100 for some of the vertical lines of the shot and ISO 1600 for the rest of it. They are also attempting to re-combine the lines of 100/1600 to give photographers the full resolution of their images. Magic Lantern has been successful in enabling dual/ISO video, but with alternating frames and some motion limitations. This new method does it in individual frames and eliminates the motion artifacts. Visit the Magic Lantern website for more information. 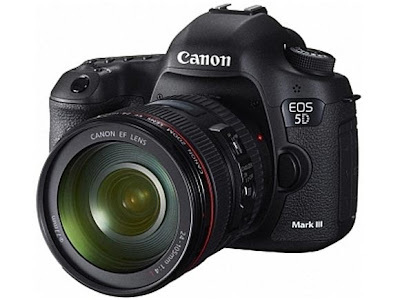 Works for both photos and raw videos on Canon EOS 5D Mark III. On Canon EOS 7D, photo only (since it can’t do raw video). What are the benefits? more dynamic range (less shadow noise). The functionality was not really in Canon firmware, but in the chip that samples the sensor. Canon firmware does not make any use of it (they just set both ISO “registers” to the same value). It was implemented on the hardware side though (and that’s why it works only on these 2 cameras, because only they have two ISO amplifiers). Hello from The Land Of The Midnight Sun - Norway. I am extremely tired and trying to get some sleep before flying into the Arctic Circle tomorrow to start my search for wildlife. Just a quick note on the latest Canon news. Now that the Canon has introduced the Dual Pixel CMOS AF technology on the EOS-70D camera, they are beginning to add this feature to other cameras as well, namely the moribund EOS-M line. Although the latest Firmware update to the EOS-M has greatly improved the AF capability of the camera, it is still a slow selling line outside Asia. Camera dealers are drastically reducing the price of the current model in anticipation of new offerings coming later this year. There may be a 18MP basic model and a higher priced, 20MP body with an advanced viewfinder. Read the earlier post on this topic. I will be without Internet access starting tomorrow once I am on the ship sailing around Svalbard. Will post more once I return to Norway. Oh darling, save the last dance for me. I am on the road again. With my fingers crossed, I hope my back pain is behind me. 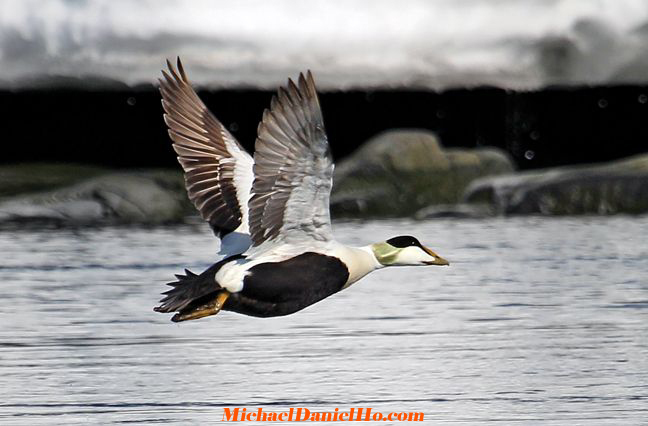 Flying to Svalbard today on a wildlife photo shoot. 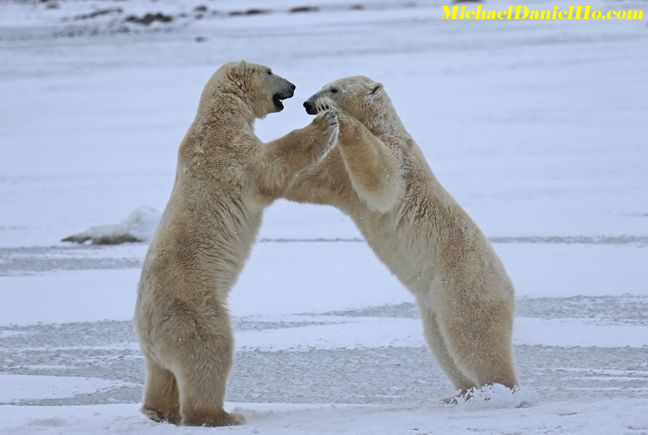 Svalbard is a Norwegian archipelago deep inside the Arctic Circle with its own ecosystem. It has its own Polar Bear, Reindeer and Arctic Fox population. The wildlife I (hopefully) should encounter, in addition to the aforementioned, include many species of whales, seals, walruses plus many different species of seabirds. Bringing the Canon EF 200-400mm f/4L IS USM Extender 1.4x lens for a field test. You can read my review of this lens here. Since I will be on a small ship sailing around the islands, there are no Internet access but will try and stay in touch when I get back to Norway. I will not be able to update the Blog with my latest travel and photography news until I return in late July. With the wind behind my back, wish me luck with my sightings. 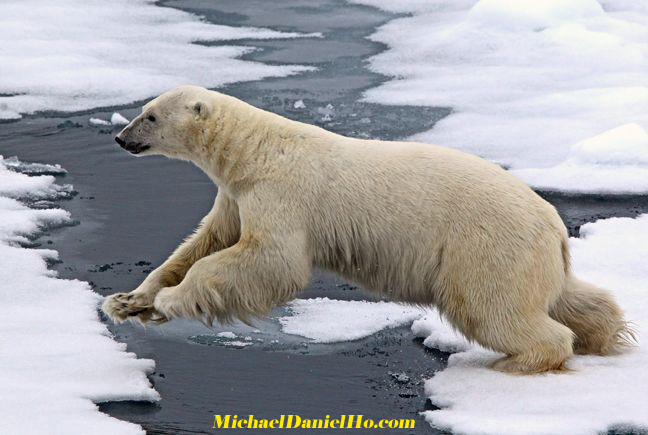 Visit my website MichaelDanielHo.com to see many Polar Bear and other wildlife images from my other photo shoots. 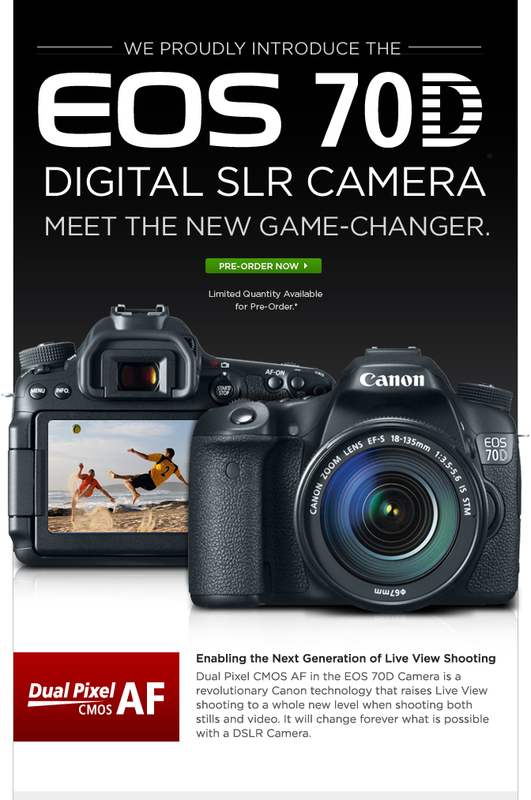 Canon EOS-7D Mk II Camera Coming In 2013? Now that Canon has announced the EOS-70D camera and delivery is expected to commence in a month or two, the attention has turned to the Canon EOS-7D Mk II, the only camera left for Canon to introduce before the end of 2013. As my readers know, I have picked the Canon EOS-7D as the best value in DSLR photography three years in a row. You can read my analysis of the camera here. The EOS-7D Mk II will be four years old in September 2013, this is about the longest product cycle for a Canon APS-C camera and I expect them to introduce the Mk II version around the last quarter of this year. The EOS-7D Mk II prototypes have been spotted out in the field and I believe Canon has not decided on the final design of the camera yet. This replacement will be their top-of-the-line APS-C model and they are banking on it to win the battle with Nikon's very aggressive push into the cropped frame DSLR camera segment. If the above specs turn out to be mostly accurate, it will be very welcome by me. Currently, the Achilles heel of the EOS-7D is its mediocre high ISO performance. I hope the camera will come with 2 memory card slots but the GPS and WiFi will not be part of the features, especially in light of the vulnerability of WiFi enabled cameras. See my earlier post on this subject. It is common for Canon to have different prototype models for field testing. I am very excited about this Mk II replacement and will definitely get my hands on one as soon as it is available. 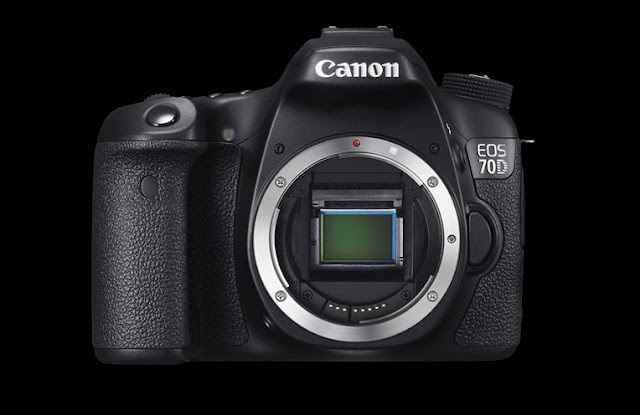 More information should leak out as the launch date for the much anticipated replacement to the EOS-7D camera approaches. The recently released Firmware Version 2.0.2 for the Canon EOS-M has gone a long way to address the slow AF complaints of this camera. Read the latest post on this topic. Now Canon has announced the EF-M 11-22mm f/4-5.6 IS STM lens will be available July 11, 2013. You can read a preview of the lens here. This lens is available for pre-order on Amazon Germany, France, Japan, WexPhotographic - UK, Hong Kong and many other Internet retailers. However, this lens is currently not available for the US market. The EOS 70D camera is finally here. It introduces new levels of performance for Live View shooting thanks to 19-point autofocus and groundbreaking Dual Pixel CMOS AF technology, which radically improves focus speed and tracking accuracy for movies in a camera that delivers stunning results. Appealing to photographers looking to move from an entry-level DSLR to a more advanced camera, the EOS 70D packs a brand-new 20.2 Megapixel sensor into a body with excellent construction. An intuitive flip-out touch-screen LCD for Live View shooting at any angle plus WiFi connectivity for convenient connection to devices such as smartphones and printers makes the EOS 70D the perfect entry into the mid-range. Click here for DPReview's hands-on review of the camera and sample photos and videos from Canon Japan's website. Because of its specification and intuitive controls, the EOS 70D is the perfect solution for those looking to upgrade from an entry-level DSLR to a camera with more advanced features and faster operation. A 19-point AF system makes focusing faster and more accurate through the viewfinder while Live View shooting is smoother for both stills and movie making thanks to Canon’s breakthrough Dual Pixel CMOS AF technology. A range of beneficial features puts creative control firmly in the hands of the photographer. With a 7fps shooting speed at maximum resolution, built-in WiFi, 19 cross-type AF points and an ISO range from 100-12,800 (expandable to ISO 25,600) the EOS 70D is perfectly suited to outdoor and active photographers looking to capture moving subjects quickly, with superb detail and sharpness at the highest quality possible in any lighting situation. 20.2 Megapixel CMOS sensor with ISO 100-12,800 sensitivity, expandable to ISO 25,600. 7fps full resolution continuous shooting rate. Swift and accurate focus in Live View and Full HD movies with Dual Pixel CMOS AF. 19-point wide area, all cross-type AF points. DIGIC 5+ image processor - 14-bit processing for high quality images. Large 7.7cm (3.0”) capacitive touch panel Vari-angle Clear View II LCD 1040k dot, 3:2 ratio. Intelligent viewfinder with 98% frame coverage. Full HD movies with external mic port, stereo microphone, timecode, selectable frame rates, and a range of compression options. In-camera HDR mode, Multiple exposure function. iFCL metering system with 63-zone Dual-Layer sensor. Electronic level, exposure compensation +/- 5 stops. A brand new APS-C sensor gives greater flexibility allowing the user to capture images in higher resolution and crop into an image with minimal loss of picture quality. Working in tandem with a powerful DIGIC 5+ image processor, colours are reproduced accurately whilst tonal gradation is subtle and natural. Thanks to new Dual Pixel CMOS AF technology, seen for the very first time in the EOS 70D, Live View focusing has taken a big step forward with two photodiodes per pixel, allowing phase-detection AF on the imaging sensor’s surface. This Canon breakthrough technology allows users to shoot both still images and high quality Full HD (1080p) movies of moving subjects, keeping them sharp at all times – even when approaching the camera. The Dual Pixel CMOS AF array covers 80% of the total image sensor area so even off-centre subjects can be tracked with higher speed and greater accuracy. The benefits of the DIGIC 5+ processor are great and have already proved themselves in Canon cameras, such as the EOS 5D Mark III and EOS 6D. The processor has been designed to complement the EOS 70D’s CMOS sensor and enables the EOS 70D to achieve fast shooting speeds of up to 7fps at full resolution – capturing maximum detail, accurate colours and low noise, in all conditions. A composite construction made from polycarbonate resin with glass-fibre, the EOS 70D is built to withstand the rigours of today’s modern lifestyle. Simple controls and intuitive ergonomics make it quick and easy to handle while a 7.7cm (3.0”) Vari-angle Clear View LCD II Touch screen makes easy work of Live View filming and composition with 100% field-of-view. With 98% coverage, 0.95x magnification and an exceptionally clear view of the subject through the lens, the EOS 70D’s viewfinder performs beautifully and offers at-a-glance information without taking attention away from the subject. With information superimposed in the viewfinder the user can easily see the chosen AF area and the active AF points while the subject is being captured or tracked. As well as standard viewfinder information such as shutter speed, ISO value and aperture, the EOS 70D offers additional shooting information and warnings such as AE lock, exposure level/compensation, spot metering circle, exposure warning, Auto-exposure bracketing as well as flash and composition information such as a useful composition grid and an electronic level indicator. Featuring a flip-out LCD screen, the EOS 70D is a very versatile tool for Live View and HD Movie shooting. The screen is a 3-inch design and features 1040k dots for very high-resolution viewing of your images and movies. With easy, user-friendly functionality, the user is able to adjust camera settings quickly and accurately with the minimum of fuss. The screen also makes it easy to capture images from awkward camera positions without having to strain yourself by over-reaching. High shots over a crowd or low shots in a tight corner are really easy to achieve while focusing is easily controlled thanks to three easily selectable AF options. Faster, more responsive continuous shooting at the highest possible quality is made possible thanks to a shutter capable of up to 7fps. In conjunction with the powerful buffer processing of the DIGIC 5+ processor, up to 65 JPEG or 16 RAW images can be taken in one continuous burst with a UHS-I (SDHC) compatible memory card. With built-in WiFi connectivity the EOS 70D can be wirelessly connected to a tablet computer or iOS/Android smartphone to shoot remotely from alternative viewpoints. Images can also be transferred via PictBridge over Wireless LAN compatible printers. Like all current EOS DSLR models in the range, the EOS 70D features Full HD Movie recording with the ability to shoot 1080p resolution movies at a variety of frame rates and compression levels. With either auto or full manual control over both exposure and audio levels the EOS 70D provides an exceptionally powerful tool for shooting professional-looking movies. Thanks to Dual Pixel CMOS AF technology, movie shooting with continuous focusing has never been easier or more accurate with moving subjects tackled with precision, even when moving towards the camera. Creative Filters such as Art Bold, Water painting, Grainy B/W, Soft focus, Toy camera, Miniature effect and Fisheye help to expand the creative options of photography. These filters can be applied to both captured RAW and JPEG files and one image can be processed several times with different filters to see the different effects. Along with the filters, a High Dynamic Range (HDR) mode allows the EOS 70D to take multiple exposures of a scene and combine them in-camera to deliver rich detail in shadow and highlight areas. What is Dual Pixel CMOS AF? A Canon breakthrough sees twice the amount of photodiodes on the sensor, allowing phase-detection AF on the imaging sensor’s surface for the first time. 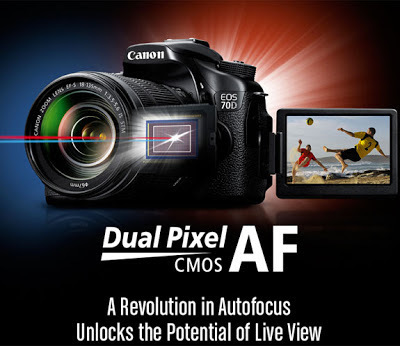 Dual Pixel CMOS AF is a sensor-based, phase detection Auto Focus (AF) technology designed to provide smooth, high-performance focus tracking in movies and fast autofocus acquisition when shooting still photos in Live View mode. It is a unique, Canon-developed technology, ideal for creating professional-looking pull-focus effects and keeping a subject moving towards the user in sharp focus while maintaining a blurred background – a defining characteristic of EOS Movies. Thanks to this groundbreaking advance, capturing a subject and retaining sharp focus, even when moving, has never been easier. Why was Dual Pixel CMOS AF developed? Featuring a flip-out 3-inch LCD screen with 1040k dots for very high-resolution viewing of your images and movies, the EOS 70D is a very versatile tool for Live View and HD movie shooting. With the ability to make a subject stand out with a limited depth-of-field, comes a requirement to keep control over focus, if the main subject moves or the point of focus changes. Dual Pixel CMOS AF was developed so that control of focus during movie making is made easier and smoother – removing the perceived notions that a DSLR’s movie mode is usable only to a professional. Additionally, Dual Pixel CMOS AF was developed to enhance the usability of shooting with Live View – moving even closer towards the same performance encountered when using the viewfinder. The EOS 70D includes a high resolution Vari-Angle LCD that can be used to shoot a range of subjects from unusual and creative angles. A phase-detection auto focus system supports photographers and expands the range of subjects that can be captured. The EOS 70D features a newly-designed Canon APS-C CMOS sensor with 20.2 million pixels. All effective pixels on the surface of the EOS 70D’s sensor consist of two individual photodiodes, which are read separately for phase-detection autofocus and together for imaging. Dual Pixel CMOS AF is possible over 80% of the width and height of the Live View frame and is highly accurate without compromising on image quality. Unlike other methods of sensor-based autofocus, which allocate either autofocus or imaging functions to pixels on the sensor, the pixels on the EOS 70D’s CMOS sensor can be used as imaging pixels and phase detection AF pixels. As a result, no additional imaging processing is required around pixels dedicated for AF, which ensures both quick acquisition of focus and maximum image quality. To perform phase detection on the image plane the EOS 70D reads left and right photodiodes independently and then calculates the phase-difference of the two parallax images. All of Canon’s current range of EF and EF-S lenses are compatible with the Dual Pixel CMOS AF system. By using this phase-difference AF technique the EOS 70D predicts the position the lens is in focus and moves it. By contrast, the more conventionally used contrast AF method looks for the focal position while moving the lens back and forth, so AF speed ends up being slower and not as smooth. With face and object tracking engaged, Movie Servo AF follows a chosen subject as it moves, or when you recompose a shot. Alternatively, just select different focus areas by simply by tapping the touch-screen when recording. At launch, Dual Pixel CMOS AF is compatible with 103 current EF lenses, spanning EF and EF-S, fixed focal length, wide-angle and telephoto lenses. The system marks a significant advancement in autofocus performance with greatly improved AF speeds. Dual Pixel CMOS AF is a groundbreaking technology from Canon that unlocks the potential └of Live View, changing forever the way users will capture video and still images with a DSLR camera. Dual Pixel CMOS AF powers incredibly smooth and consistent autofocus – like that └of a camcorder – so focus transitions are natural and subjects remain locked in even as they move. It also enables phenomenally accurate and faster-than-ever autofocus through an LCD monitor, allowing the user to realize the unique compositional freedom of angle that Live View is capable of providing. The compatibility of Dual Pixel CMOS AF with 103 different Canon EF lenses empowers the user with exceptional optical tools for nearly limitless creative options. All these remarkable advances are possible thanks to an innovative technological design. For the first time in an EOS camera, the individual pixels on the CMOS sensor are capable of both capturing light and performing phase-difference detection autofocus. This revolutionary leap in Live View autofocus performance cements Live View shooting as an outstanding complement to traditional viewfinder shooting, unleashing wonderful new possibilities for dynamic, creative, high quality video and still capture in more situations than ever before. 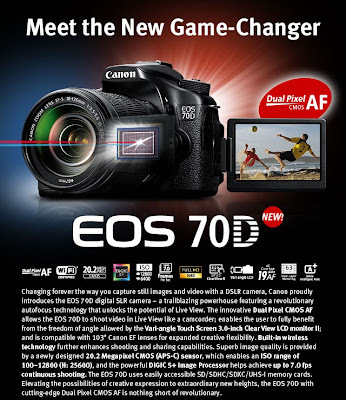 London, UK, 2 July 2013 – Canon today unveils an outstanding new addition to its world-famous EOS series – the EOS 70D. Designed for aspiring enthusiast photographers, the EOS 70D is the ideal camera for anyone looking to take their photography to the next level. It combines completely new, world-first Canon imaging technology with powerful, creative and wireless sharing features – delivering a responsive, all-purpose camera ideal for capturing the moment with stunning images and Full HD video. The EOS 70D features a new 20.2 MP APS-C CMOS sensor, designed and manufactured by Canon. It’s the first Digital SLR in the world to feature ground-breaking Dual Pixel CMOS AF technology, which delivers smooth and accurate autofocus (AF) when shooting Full HD movies and fast AF acquisition when shooting in Live View mode. Paired with the 14-bit DIGIC 5+ processor and 19-point all cross-type AF System, the EOS 70D captures incredible, full resolution images at up to 7 frames per second, with up to 65 JPEG or 16 RAW images in a single burst*. Additionally, a native ISO range of ISO 100-12800 enables photographers to shoot in lower light conditions and use faster shutter speeds whilst retaining high image quality. Canon’s new Dual Pixel CMOS AF provides swift AF performance when shooting in Live View mode and smooth accurate focus for Full HD movies. It makes it easy for users to take their next step with movies, enabling them to keep moving subjects in sharp focus and create professional-looking pull-focus effects. The technology utilises advanced CMOS architecture, allowing two photodiodes to be mounted within each pixel, both of which can be read independently to achieve autofocus, or together for image capture, with maximum image quality at all times. An advanced AF system for stills includes 19 cross-type AF points spread across the frame, providing high speed, accurate AF – ideal for tracking sports and wildlife subjects as they move within the frame. The AF system is customisable, allowing photographers to adapt to the subject they’re shooting. AF points can be used individually, together in small groups, or as a wide active area for more unpredictable subjects. A dedicated AF area selection button, positioned conveniently next to the shutter release, enables quick switching between modes, without having to take the camera away from the eye. The EOS 70D’s powerful specification is packed into an expertly-engineered body that’s designed for comfort and swift operation. The Intelligent Viewfinder, with 98 per cent frame coverage and 0.95x magnification, allows photographers to comfortably frame their images and visualise settings via the electronic overlay. Conveniently-placed controls provide instant access to the most frequently used settings, such as ISO, AF mode selection and metering, so users can quickly change settings and concentrate on capturing the moment. A 7.7cm (3.0”) Vari-angle Clear View LCD II Touch screen with a sharp 1,040k dot resolution is ideal for video shooting, or composing images from unusual and creative angles. The screen is a capacitive type, which supports a series of multi-touch gestures including swiping and pinch-zooming – perfect for navigating menus, amending settings or flicking through images. The EOS 70D is the latest EOS model to feature integrated Wi-Fi, providing the freedom to remotely control the camera, as well as share images. Using Wi-Fi connectivity, users can connect to the EOS Remote app and control a wide range of image settings, including ISO and exposure, as well as focus and release the shutter. Photographers can also remotely use Live View mode, as well as review and rate their images. The EOS 70D features a host of creative modes to make capturing unique images easy. In-camera HDR removes the challenges of shooting in tricky, high contrast situations, merging three exposures into one that captures more detail in both the shadow and highlight areas. With multiple-exposure mode, photographers can shoot and combine up to nine exposures into a single image, or use a range of Creative Filters to instantly change the style and look of their shot. Experimenting with creative off-camera flash is easy, thanks to the Integrated Speedlite transmitter, which provides in-camera control of multiple Canon Speedlite EX flash units. Alongside beautiful stills, the EOS 70D allows photographers to create high quality movies with ease. Full HD (1920 x 1080p) resolution video can be captured with a choice of selectable frame rates, including 30, 25 or 24fps, and 60 and 50fps at 720p, and a range of compression options for post-editing and sharing. Thanks to new Dual Pixel CMOS AF, Movie Servo AF mode tracks subjects as they move, or even as shots are recomposed, ensuring they’re always in focus. Alternatively, users can select different focus areas over 80 per cent of the frame** simply by tapping the touch-screen, even when recording – ensuring that movies stay sharp and clear if a subject moves or the user changes the composition of a shot. Videographers can also enjoy stereo sound using the internal microphone, or enhance audio with the in-built external microphone input terminal. Full control over settings such as aperture and ISO is also possible within manual mode, giving users greater freedom as their skills develop.